Most unmanned vehicles are remotely controlled by radio and their position is pinpointed via GPS. This is problematic for unmanned subsea vehicles, as electromagnetic waves do not propagate nearly as far in water as they do in air. Today, transmit speeds can come up to a couple of kilobytes per second when the range is about 200 meters. Alas, it’s still insufficient for the videofeed needed for remote control. The most widespread unmanned subsea vehicles are ROVs (Remote Operated Vehicles). Said vehicles has a wired connection to the operating ship. This umbilical cord transmits video as well as the steering signals. To perform a cable survey the ROV is manually steered along a cable and inspected for damage. This is both tedious and expensive. Further, the need for an operating ship is a large drawback as it causes a significant cost increase. This is especially true for time consuming operations like cable surveys. The alternative to ROVs are AUVs (Autonomous Underwater Vehicles). An autonomous system is more independent that an automatic. In short terms it’s able to fulfill a mission entirely without human intervention. Ideally, an AUV is self-reliant and does not need an operating ship. This makes it more cost effective. Unfortunately, accurate IMUs (Inertial Measurement Unit) are expensive and the exact coordinates of the object to survey isn’t always known. This might cause the AUV to search in the wrong area or even get lost entirely. To prevent the latter, ships are often used to follow the AUV. Today, this is the one of the greatest criticism of AUVs as they, in practice, also need an operating ship in order to function properly. By using the magnetic field produced by a power cable it’s possible to track along it with relative ease and high accuracy. Potentially, this can reduce the cost of cable surveys. Additionally, it enables tracking of buried cables, as well as a way to determine how deep they are buried. The latter is important as cables that are not properly buried are more prone to take damage. By mounting a camera on the AUV an operator can inspect unburied sections post-survey. There are mainly three types of underwater power cables. The discussion here will be limited to three-phase AC power cables, where there is a separate cable for each phase. This is common for high power transmission lines crossing relatively small portions of water (< 100km). For longer cables, HVDC (High-Voltage DC) is used, as the loss from inductance to water outweighs the expenses of ACDC-converters. The procedure for autonomous cable tracking can be roughly divided into three. Signal processing to extract the magnetic field generated by the cable, Localization of the cable from its magnetic field and Steering the AUV along the cable. All these parts are performed live on the AUV; i.e. without any human intervention. To use the cables’ magnetic field for autonomous tracking the AUV must be within range and isolated from other fields. The latter includes anomaly fields from magnetized rocks, the earth’s geomagnetic field and the field induced by the AUV. The range is proportional to the current in the cable and dependant on the accuracy of the magnetometers. As an example, the new 420Kv cable in Oslofjorden will be detectable at about 30m from the FLC3-70 magnetometer that costs about 1000NOK. All AC currents in Norway are at 50Hz, so the magnetic field will oscillate at this frequency. Both the anomaly field and the magnetic fields are static. Lastly, the AUV induced field can be tuned. Consequently the sole field at 50Hz is produced by the cable. This makes it extractable from the sampled signal by the discrete Fourier transform, which is a well-known tool in engineering mathematics. The purpose of the Fourier transform is to decompose a signal into its frequency part. Basically, it does this by calculating the covariance between the sampled signal and imaginary signals ranging from 0 to the sampling frequency. If the covariance is high the current frequency is a part of the signal. 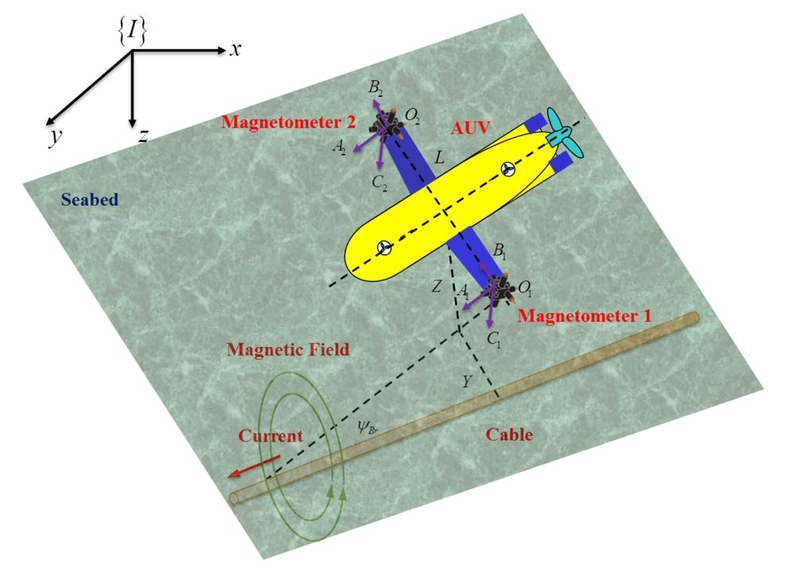 By using a three-axis magnetometer and implementing the Fourier transform, the amplitude and phase shift of the cable generated field can be isolated in each direction. After extracting the cables magnetic field it’s possible to determine the relative heading and cross track distance to the cable. 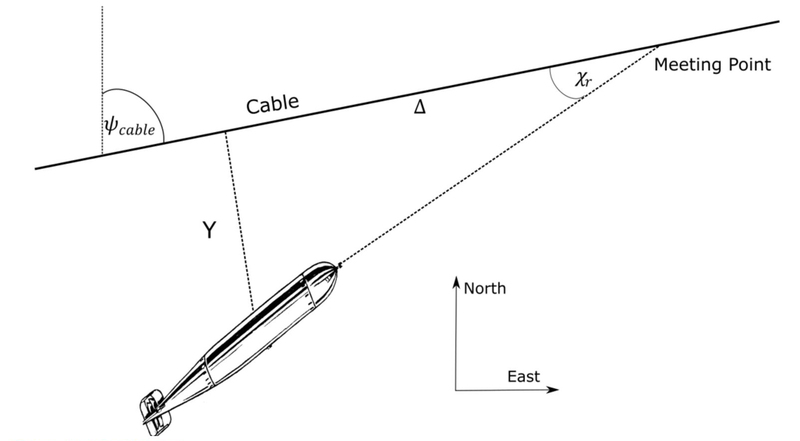 These are the parameters needed to autonomously steer along the cable and are notated in Figure 1 as ψbr and Y. The magnetometers are three-axis, meaning that they decompose the magnetic signal in x-y-z components relative to the AUV. We know the magnetic field is perpendicular to the cable, so the relative heading ψbr between the AUV and the cable can be determined by trigonometric functions. 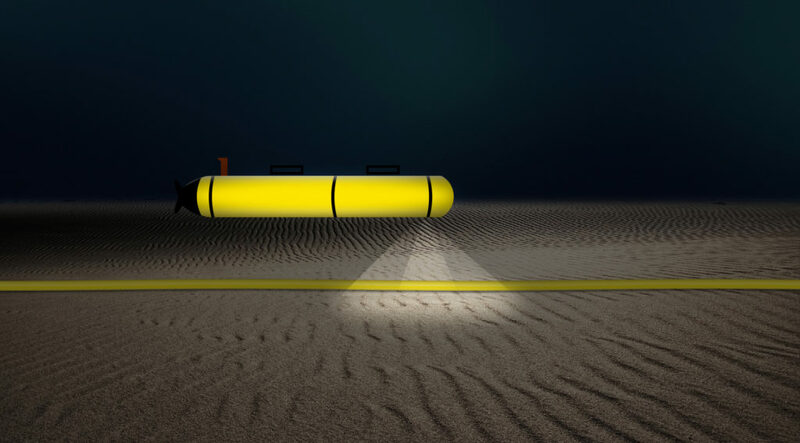 As most AUVs are equipped with a compass, it’s heading ψAUV is also known. From ψbr and ψAUV, the heading of the cable, ψcable, can be determined. The distance to the cable is a bit more complicated and requires two triaxial magnetometers. By triangulating the magnetic field at the two magnetometers the exact distance to the cable can be determined. The equations are rather lengthy and are omitted here. For readers with special interest, a derivation is given in Xiang, X. (2016). To track along the cable the AUV must be sufficiently close and the relative heading must be zero. The now known cable heading ψcable and cross track distance Y can be used to implement a steering algorithm. This makes it a PID-controller, which is an extremely popular low-level controller. It’s used in everything from AUV autopilots to regulating temperatures in ovens and so on. It has the edge over model-based controllers because it does not require a transfer function of the system, which might be difficult or even impossible to derive. Its drawback is the required tuning of the K-gains and that the controller will never be optimal. Which is an integral part in cascade with a low pass filter. Or simpler put; the heading is sum of the rudder angles where too rapid changes are filtered out. K and T are here not achieved by tuning, but by a mathematical model of the craft. For AUVs the mathematical model tend to be very complicated as it, compared to ships, has two extra controllable degrees of freedom (heave and pitch). Therefore, they are usually implemented with PID low-level controllers. Figure 2 shows the control loop of the system. In the AUV block the heading is measured and the relative heading is calculated from the magnetometer readings. In the PID block the rudder angle is calculated from the relative heading. Whether a tuned PID or a derived model-based controller is used, the AUV will be able to steer along the cable with the same heading. However, only using a heading autopilot does not ensure that the AUV moves closer to the cable. Instead of making a new low-level controller, a guidance system can be used. A common guidance law is LOS (Line of Sight). LOS was originally developed during the Cold War for military operations. It was used to intercept moving targets by predicting the meeting point. Specifically, it was used in surface-to-air missiles by constantly recalculating and adjusting the heading to ensure impact on the target aircraft. Assuming the cable will continue in a somewhat straight line, LOS guidance can be used in a less explosive manner to diminish the horizontal distance while holding a smooth course. An illustration of the LOS steering law is shown in Figure 4. The desired heading is the heading of the cable added with the heading to the meeting point χr. The distance to this point is decided by tuning Δ. Note that the meeting point is recalculated at each iteration, making the AUV steer in a gradual curve until the cross track error is diminished and it’s directly above the cable. At this point, a mounted camera can be used to record video along the trajectory for inspections post-survey. Figure 4 shows an illustration of the control loop when including the LOS-guidance in cascade with the autopilot. The subsea environment introduces many challenges for surveying installations. Today, ROVs are the most used solution. For a relatively small survey area, it may be the best solution. Yet, for cable surveys, which span a large distance, they have severe limitations both in cost and time. A proposal is to use AUVs in conjunction with magnetometers to autonomously track along power cables. This might dramatically reduce the cost of such surveys. A great concern for AUVs are the complicated algorithms needed to find the survey area and to prevent getting lost. By using the magnetic field of power cables, it’s possible to determine points to steer after with relative ease. When this critical information is obtained, many existing control algorithms can be implemented. Fossen, T. (2011). Handbook of Marine Craft Hydrodynamics and Motion Control. Kjetså, A. S. (2017). Localisation of Submarine Power Cables by Magnetometers on Remus 100AUV. Trondheim. Xiang, X. (2016). Subsea Cable Tracking by Autonomous Underwater Vehicle with Magnetic Sensing Guidance. Sensors.